There is a communal Pesach Seder that has been sponsored by a local family for a generation. Last year, was the first year the patriarch of the family, who had initiated this noble tradition, was no longer counted amongst the living. In his honor his children and grandchildren continued the sponsorship and attended the Seder in full-force. I had the distinct honor of leading that Seder. 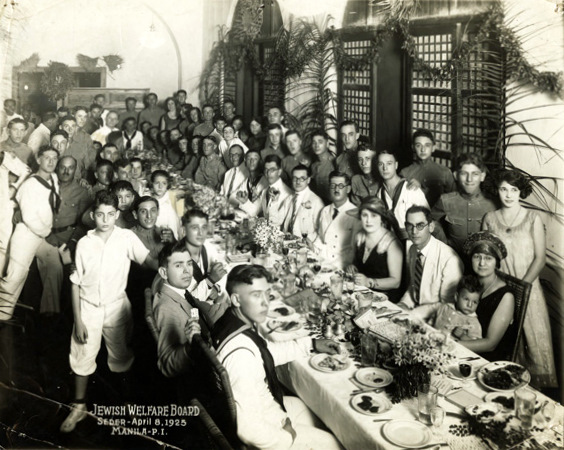 Over the years, the Seder became almost the exclusive venue for the needy and the infirm. Their main interest seemed to be the food. Immediately after dessert, 200 participants performed their own Exodus from the proceedings, leaving a handful of die-hard Hagaddah readers left. This year, the sponsors decided to upgrade the level of the catering, hiring perhaps the best Kosher caterer in Montevideo. They also very generously donated beautiful Hagaddot – last year’s Hagaddot were ancient, poorly constructed (no page numbers and pages out of order) and insufficient. After understanding first-hand the nature of my clientele and their interests I went on the offensive. I consulted with my Rabbi in Israel as to what is the absolute minimum of the Hagaddah that needs to be said. I printed out a guide as to the page numbers we would be covering and handed it out to everyone. At the beginning of the Seder I announced that I would make a deal with the participants that were eager to leave immediately after dessert. I would shorten the event if they agreed to stay 15 minutes after dessert. They nodded their agreement. We made Kiddush and drank the 1st cup of wine. We washed hands (not enough washing stations – note for next year). We ate the Karpas. We broke the Matza. We sang the popular songs. I made the youngest person at each table stand for Ma Nishtana. We were 250 people in a large hall. 30 tables. Three long rows of 10 tables each. I divided each row into “Pesach”, “Matza” and “Marror” and had each section practice screaming it. When it came time to declare Pesach, Matza and Marror, the hall shook from the force of everyone yelling it. We did the plagues. We sang Dayeinu. We drank the 2nd cup, washed for the Matza (biggest critical path – must have more washing stations). Ate the Matza, ate Marror, ate the Sandwich and had a sumptuous meal. I made a point of visiting every single table at least once, if not twice. The people were ecstatic with the Hagaddah, the service and especially the food. For some of them, it was likely the best meal they’ve had in years. There were a number of families that paid to participate. There were some families with young children, as well as lone elders, disabled and social services clients. We hosted a Russian-Israeli engineer who was visiting from Nigeria to work on a Uruguayan natural gas project. We also had the emissary of the Keren Kayemet together with his wife. I got to field a variety of questions and issues, including why the Kosher chickens this Pesach had more feathers, one drunken crasher that needed to be kicked out and advising the guests that the Hagaddot were not gifts and to please not steal them from the premises. My highlight and I think as well for many of the participants was Crossing the Sea. Between the main course and dessert I forced everyone to stand up. Then I marched them out of the dinning hall into the smaller foyer. I got four volunteers to hold blue tablecloths between them. They created a wall in front of the crowd. I recounted how our ancestors in their escape from Egypt found themselves chased by the Egyptian army and trapped by the Sea. The Jews complained (what else is new?). God commands Moses to take the people forward. The two tablecloths suddenly parted and instead of a wall we had a passageway. Two hundred people marched through the shimmering blue passageway, surprised, excited, chatting happily as they made their way to freedom and dessert. After an excellent dessert I was mildly surprised to see almost everyone sitting and waiting expectantly. I had them eat the final Matza, the Afikoman, a Rabbinic command, which they had missed out on last year. We then drank the 3rd cup of wine (my head was really spinning at this point, given the large goblets we were using). We sang Echad Mi Yodea, drank the 4th cup, sang Leshana Haba Beyerushalayim and then to the surprise of many, I dismissed the crowd and thanked them for their participation. They didn’t need to skulk off while the service was still going on. They had made it to the end — perhaps for the first time in their Communal Seder history. Almost everyone came up to me smiling to thank me as well as for the wonderful food. Many said it was their best Seder ever. Last year I was sick going in to the Seder, couldn’t talk by the end of it and it took me a while to recover. This year, I could still speak by the end, was feeling good (though tipsy) and actually made it to and participated in the end of another Seder I was invited to. By the next day I was already getting feedback how people thought it was an amazing Seder, and how others already want to sign up for next year. I suspect it was mostly because of the food, though I like to think the managing also had a bit to do with it. There is something to preparation and experience that improves the quality.